Are you feeling the urge to find a protein powder that will help you build muscle, recover more efficiently, and work out more effectively? Are you a vegan or vegetarian looking to do those things while still being aware and respectful of your dietary ideals and needs? It can be a tough row to hoe when you are vegan or vegetarian and also looking for optimum performance in your body. Many foods and products today have hidden ingredients that vegans and vegetarians need to be aware of, and the work that goes into such a hunt can be frustrating; it’s better to have products that put the information out there and are clear and concise on their listings. There are several great protein powders for women on the market that take these needs into account, and one such protein powder is Plant Fusion, a product made by Nutra Fusion Nutritionals. 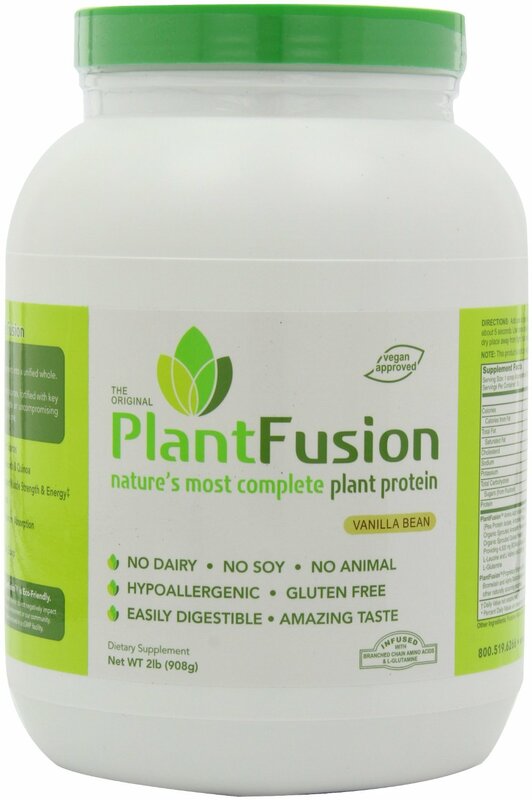 Plant Fusion has quite a few great features that make it a perfect choice for the vegan or vegetarian athelete or lifter looking for a great protein powder. It also is a good choice as a dietary supplement for vegan or vegetarian eaters who need to supplement more protein sources into their diets without the use of animal products. Plant Fusion’s vanilla bean flavor is one that our taste testers tried, and from those trials we had various opinions and thoughts. 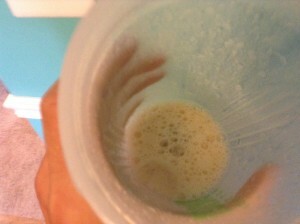 It was noted that the product smells very “planty” and natural; other testers noted its milky, frothy appearance. Plant Fusion is composed of all natural ingredients, so the taste and smell definitely reflected that. One taste tester even commented, quite creatively, that it smelled like “a plant and a cow had a baby.” When looking at taste itself, the product tastes as mildly grainy, with a mild vanilla flavor, not very strong. Keep in mind that we tested the product mixed in a blender bottle with only water, so that the true flavors of the product could come out. Based on these findings, we recommend Plant fusion as a good option for mixing with other items, such as almond milk, ice, fruits or veggies. Being an all-natural product, Plant Fusion is a great option for vegans and vegetarians, as well as anyone focused on their health and eating a clean and whole diet. 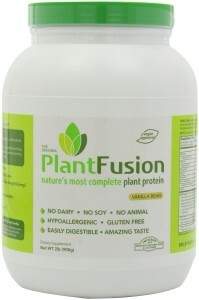 Plant Fusion uses a plant protein ”fusion” as they call it, which is a combination of plant proteins leaving it fully vegan. The protein comes from pea protein, artichoke protein, and a blend of amaranth and quinoa powders, for a “fusion” of whole, healthy ingredients. The product contains 21 grams of these plant proteins in a one-scoop serving, and yield 70% protein per serving; it’s a great, pure choice if you’re looking for clean, natural protein. 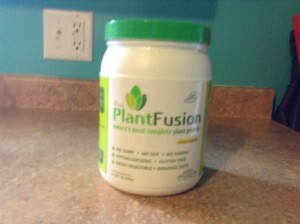 Plant Fusion doesnot add additional vitamins and minerals, but does feature a proprietary enzyme blend. Together with this enzyme blend, Plant Fusion is lactose free, so you won’t have to worry about tummy irritation or digestive problems. Speaking of free, Plant Fusion is also soy, dairy, and gluten free, as well as hypoallergenic, so you don’t have to worry about food allergies or other issues when consuming this protein powder. Plant Fusion offers a clean product, while keeping in mind consumers who might have special dietary needs and desires but still need a protein source to keep them energized, strong, and building muscle. In conclusion, Plant Fusion is a great choice if you have special dietary needs but still desire a protein powder to supplement, lose weight, or gain muscle tone. The taste might be a little difficult, but added in with other foods or liquids can help. You’ll receive 4 plant proteins without worrying about artificial additives, and the enzyme blend will leave things easy on your stomach. Vegans and Vegetarians, enjoy your protein!